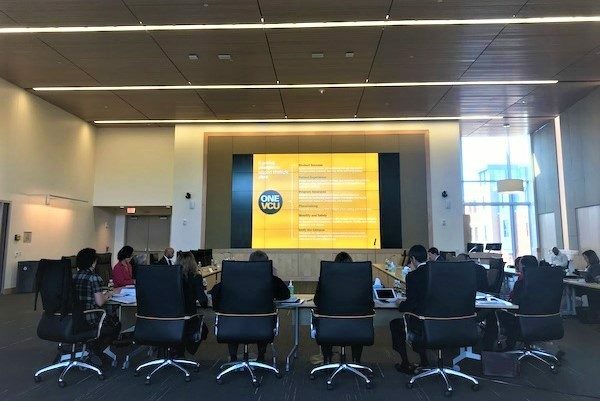 Hours before the VCU men’s basketball team was to tip off in its first-round matchup in the NCAA Tournament, the university’s Board of Visitors signed off on a new master plan and hinted at a number of future projects. The board voted to approve the university’s “One VCU” master plan, which will serve as an updated framework for development opportunities on and near the school’s Monroe Park and MCV campuses in the next 15 years. Projects outlined in a draft of the master plan include a renovated student commons, a transdisciplinary neuroscience building, and a humanities and sciences building expansion, as well as new green spaces and transit changes through “intersection improvements” and dedicated bike lanes on campus. The plan also calls for multiple new buildings near its new Institute for Contemporary Art at Broad and Belvidere streets, including a student gallery and a performing arts center. The university has been gathering real estate along that corridor, most recently snagging Steve Uphoff’s vacant lot at 606 W. Grace St. last year for $3.8 million. Rollout of the master plan is scheduled to begin this month following adoption. 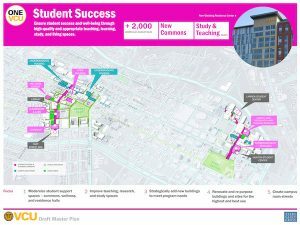 VCU began plotting the new master plan in fall 2017 and presented it to the city’s Planning Commission last November. VCU President Michael Rao also gave a report to the Board of Visitors at the Friday meeting, during which he offered updates on VCU Health’s recently opened $87 million College of Health Professions building at 900 E. Leigh St. and forthcoming $350 million Children’s Hospital of Richmond at VCU planned for 1001 E. Marshall St.
Rao also noted that the Virginia General Assembly awarded $105 million to VCU for a STEM (science, technology, engineering and math) building to be built on the site of the Franklin St. Gym at 817 Franklin St. The Board of Visitors also gathered last Thursday to discuss the university’s budget, at which the administration recommended not raising the school’s tuition from $12,096 for in-state students and $32,742 for out-of-state residents. The administration also recommended a 4 percent salary merit increase for VCU faculty for fiscal year 2020. The board is set to vote on the budget at its May 10 meeting.